Mauro Morandi, a 79-year old hermit on the small island of Budelli in southern Italy for nearly thirty years, is threatened with eviction, reports Il Globo. 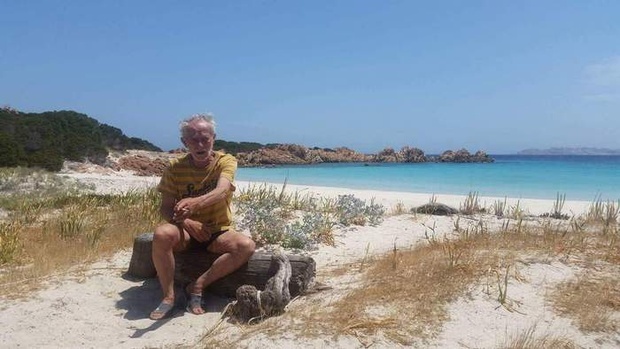 Budelli was recently incorporated into Sardinia’s Maddalena Archipelago national park, and authorities claim that his presence on the island is incompatible with that designation. Morandi, who survived an eviction attempt several years ago due to thousands of petitions on his behalf, argues that, on the contrary, his presence protects the isalnd’s fauna and flora from the neglect of tourists and other island visitors. XinhuaNet features a story on a wilderness couple devoting their lives as caretakers of an ancient and neglected forestland in China. “For about two decades, Luo Yuxiong and her husband Zhao Jinshan have led a life of solitude in the barren land in northwest China’s Xinjiang Uygur Autonomous Region.” Details their decades-long environmental work to restore forest to a once-ravaged area. A brief 2:28 CNN video update on Father Dario Escobar the hermit: “Meet the hermit who’s the last of his kind: Father Dario Escobar lives high in the mountains of Lebanon and is the region’s last remaining hermit. CNN’s Ben Wedeman journeys to speak with Father Dario, who is not as isolated as one might think.